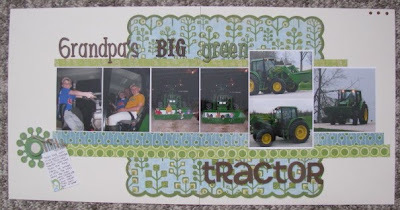 Erica over at Personal Scrapper is hosting another Croptoberfest - 31 challenges in 31 days. I'm game! This challenge was to use doubles. 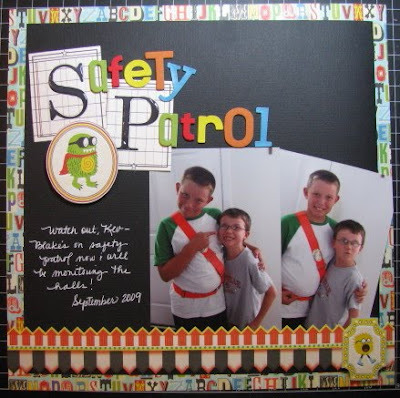 I used two Jenni Bowlin monograms, two monster cut outs, two photos (of two boys! 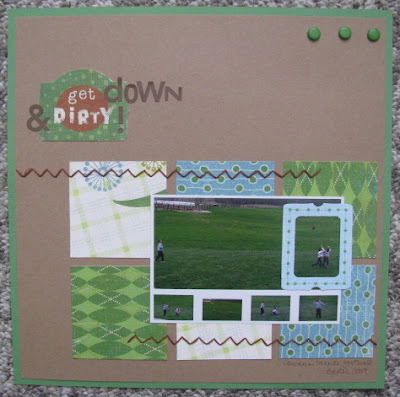 ), and two die cut strips along the bottom. LOVED mixing alphas here and using my new Sassafrass Lass papers. Today was the day for me to post a challenge. Since it's the first Saturday of the month, I came up with a "super Saturday" challenge to scrap either an event that happened on a Saturday or something you like about Saturdays. I scrapped an outing at Home Depot since the first Saturday of every month is the kids craft day. 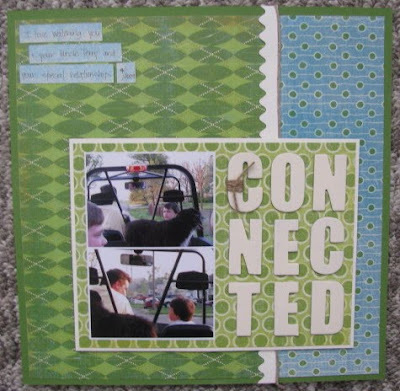 The base of the page is Jillibean Soup and the strips are scraps of SEI papers. 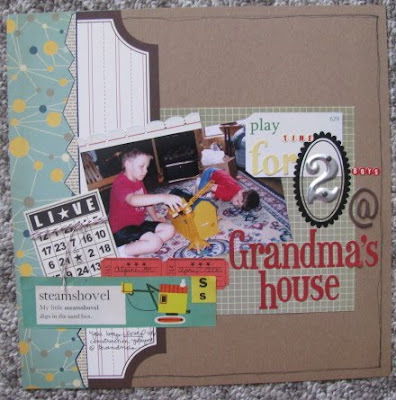 This challenge was to make your own embellishment. I made a couple pumpkins - don't laugh! They look better in person. I used circle punches, wadded up the circles, flattened them, inked them and then layered one of them. I also hand-cut stems for them. I even pulled an OLD Lil' Davis binder clip from my stash to use as an embellishment. 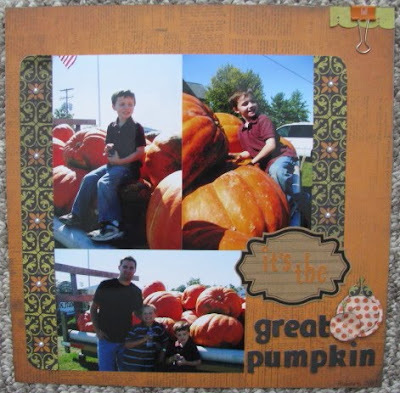 This LO uses the new October Personal Scrapper monthly kit. On the 4th, after the tractor LO, I kept the My Mind's Eye papers out and scrapped with them until they were gone. 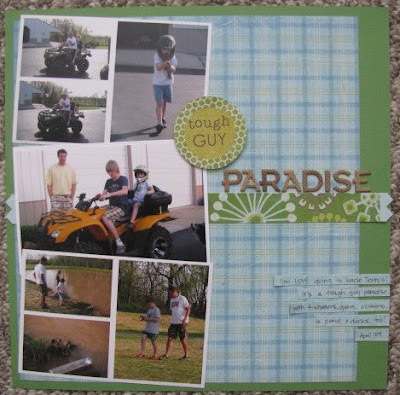 I was able to get three more 12x12 LOs out of the papers my secret sister, Kim/kimmcc sent me last month. The first two LOs are from a vist to Uncle Terry's in April. Both are for Kevin's album. Finally, I finished this one for Blake. The boys played tackle football with their younger cousin on Easter at their grandparents' house. I used a die cut frame to focus on Kevin getting ready to tackle his cousin. My title is too appropriate! Well, 5 challenges down...26 more to go. Wish me luck!